Charter Global have recently completed work on a luxurious new build property in London’s prestigious Avenue Road. The brief was to fit domestic security shutters for an effective concealed security solution. Charter Global were approached to assist in fitting domestic security shutters to a new build property in London. Physical security was required for all doors and windows across the property – from the basement to the second floor. This was to compliment the electronic security measures and to create a holistic security solution to the property.We worked with the client’s representative and the architect from an early stage of the project. Constant contact early on in the project meant that the installation was trouble free. The Equilux Built-In Shutter lintels are designed to accept fixing for a number of period stone window surrounds from bespoke stone casting company, Haddonstone. In addition to the interface with the external surrounds, the client requirement includes for insect screens to each opening. The client requested that the shutters should descend internally and the insect screens to operate externally. 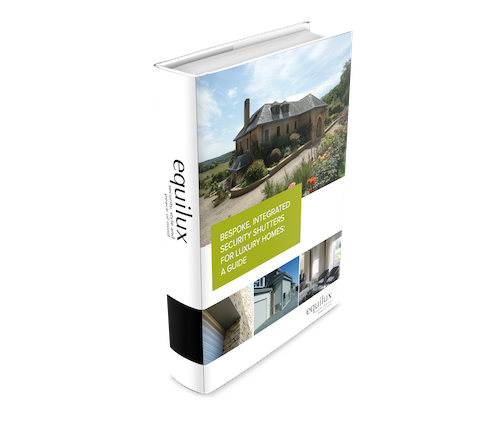 The Equilux shutter system is designed to accommodate an independently operating insect screen rolling within the structural lintel. Working with the project design team, a lintel design has been developed to accommodate the requirement whilst maintaining the air-tightness of the whole structural Equilux lintel shutter unit. As the project progresses the finished openings will be surveyed, and the Equilux side guides provided for installation in the jambs of each opening. At the completion of the project, scheduled for late 2015, each opening will have a concealed, independently operating, Equilux Security shutter and insect screen; truly security, style and peace of mind.